In Spring 2012, 3,000 files evaporated from our Dropbox account, and Dropbox was MIA. No phone number, no email response. Just crickets. Each year, we honor the ‘incident’ with our Customer Service Awards. I saw picketers outside of Wells Fargo, and didn’t understand why. Now I know. It’s a pretty miserable experience working with them because A.) they have control of your money and can access it for superfluous fees whenever they feel like it, and B.) their staff training lasts about 37 minutes before they’re turned loose on unsuspecting customers…possibly you. 9/10 times my call to the 800 number informed me that I needed to speak to a branch agent. 10/10 times, my branch agent told me to call the 800 number. I started calling from the lobby of the branch. Routinely. After attempting to set up auto-credit card payments 5 different times and receiving 5 different late fees, I personally called and had them set it up. When I went to close the accounts, I couldn’t turn off the auto-pay. The customer service on the phone and from the branch manager was more customer antagonistic…see #1, and add about 10 tons of attitude. Just when you thought the irony was over…my last call was the very best one I had, with a helpful and lovely gentleman. Wells Fargo: news spreads. And the peons of the world are tired of taking it. After an exhaustive search (if you want my spreadsheet, just ask! ), I moved my money like my Mama told me: to a small bank who cares. Enter stage left: Commerce Bank — big thanks to Susan Kane who has bent over backwards for us! We’ll highlight them as our best example next year. For people who want to put your money where your values are, although I can’t speak to their customer service, take this quiz, and consider One Pacific Bank. 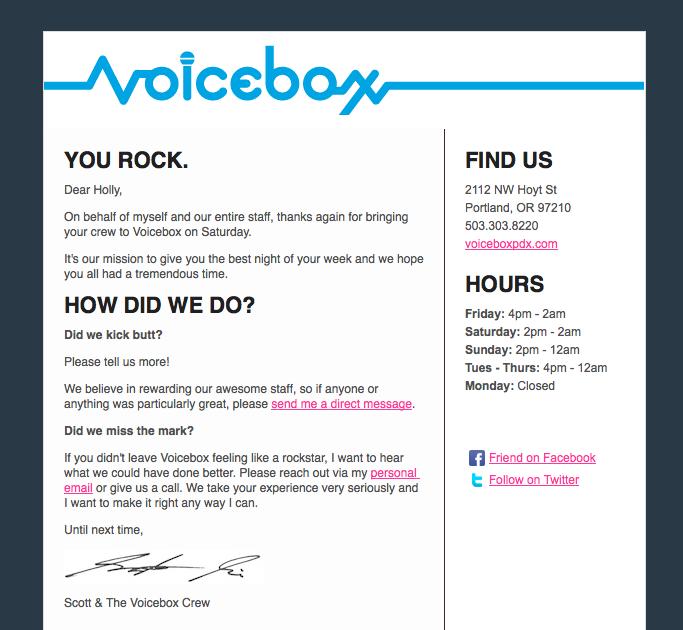 Voicebox first shows gratitude for our business. Then, they let us know that even if they weren’t perfect, they want to improve. Their mission is “to give you the best night of your week,” and this message proves that they mean it. Notice how a response goes directly to the owner, Scott, and he listens to each complaint or commendation. He thanked us for the acoustic tip we gave him, and he even gave us a free drink for our next visit! Don’t hide the comment cards! In fact, put them front-and-center. In an age where an unhappy customer can voice their complaint (or compliment) to millions in a matter of seconds, you don’t want to miss the opportunity to please and delight…because it will cost you almost nothing, yet bring lifelong customers.